At a turning point in your life? Facing difficult choices or challenges? Missing something important in your life? Peter is founder of the Nirarta Centre for Living Awareness.. He has served as a trainer, consultant, and coach to organizations and individuals in many countries over the past forty years. He is skilled at leading groups as well as one-to-one coaching and counselling. He has been a meditation guide for almost 50 years and has trained extensively in NLP, Person Centred Expressive Therapy, and other forms of expressive work. 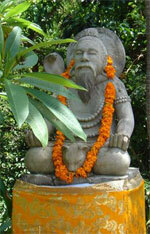 He has been leading retreats at Nirarta since its inception in the 1990s. A gifted facilitator of deep transformation and awakening in individuals and groups, he is the developer of Conversations on the Edge of Silence for supporting growth and development in individuals, couples, groups, and communities through Generative Dialogue, as well as the in-depth holistic Re•Patterning process. 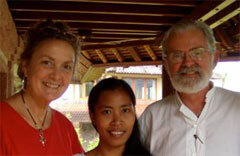 Peter has led many individual and group retreats since the founding of Nirarta over 20 years ago. He has been a meditation guide for almost 50 years and trained extensively in NLP, Person Centred Expressive Therapy, and other forms of transformational work. He has been absorbing the essence of Balinese philosophy and tradition for 25 years, drawing inspritation from its exquisite beauty and deep wisdom in supporting a balanced and whole way of life – in body, mind, and spirit. For many years, he has worked as a trainer, consultant, coach and mentor to organizations and individuals internationally. 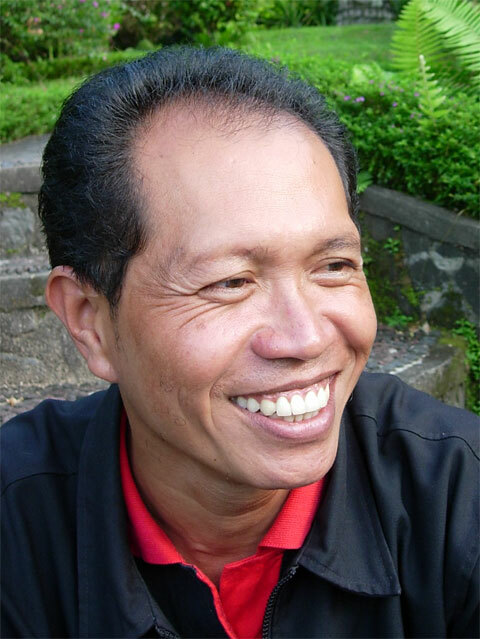 Gede Oka, known as Widé, has provided massage at Nirarta for a number of years. Widé is an accomplished healer, serving the Balinese for a range of problems, including difficulty in conceiving, with patients coming from as far afield as Denpasar. Deep body massage, which has toning and healing qualities, and is highly recommended by people who know massage as among the best they have received. Reflexology for diagnosis and treatment of particular health problems. Widé tends to be very accurate and skilled in making a shift in health issues. Ida Ayu Putri Mayuni (Dayu Mayuni) is responsible for day-to-day operations and maintaining the spiritual energy and balance at Nirarta in the traditional way. Dayu is from a Brahmin family, with roots in Sidemen. She is Peter's wife and mother of Maya and Mira. Dayu Mayuni is assisted by Gusti Adi Putra, and other members of Nirarta staff. Dayu speaks good English. For more about Dayu, see here. Mangku Mastra is a healer, meditation and yoga teacher, and 'permangku' or temple priest/custodian from Tabola Village, close to Nirarta. After a period of searching and study of sources from both Bali and India, he received the elements of the current practices. He is the permangku or temple priest from our local Pura Dalem temple. He is married, with three children. Professor Luh Ketut Suryani is a Balinese psychiatrist, meditation teacher, healer, university professor, social activist and mother of six. She is the co-author of a number of books, including The Balinese People, a critique of Bateson and Mead's perspective from the 1930s. She is also the co-author of Trance and Possession in Bali and two other books with Peter, Moksha and Living in the Spirit. Suryani is dedicated to helping people draw on the extra dimension of spirit in everyday life. 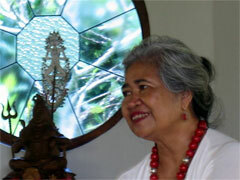 Her own full life – including active participation in Balinese public life and a number of social initiatives for the elderly, students, drug abusers, and the prevention and treatment of pedophilia – is an example of what is possible when we draw on the extra reserves of the transpersonal in our lives. Her unique personality and perspective are deeply appreciated by groups she works with and have also been a pillar of strength for Nirarta since its inception. Carla and David Osgood are practising clinical psychologists and teachers from Vermont, USA. They bring groups regularly to Bali to deepen their therapeutic and professional training with personal development and cross-cultural experience. From their experience in Bali, David and Carla have developed a highly sensitive approach to cross-cultural communication, which enriches both the groups they bring and the people whose lives they connect with during their programmes. Their work bridging consciousness, culture, and community is profoundly healing and transformative for individuals and groups they lead. It is an inspiration for what we aim to achieve with individuals and groups coming to Nirarta. David and Carla's programmes link the University of Vermont with Nirarta and other communities in Bali, as well as with communities in Belize and Samoa. Serena, originally from New York, has been living in South East Asia since 2011. Highly intuitive since birth, Serena has always found solace and connectivity in nature. After attending university in New York City, arriving to the complexities of this urban matrix only two weeks prior to 9/11 and staying for 6 years, Serena was ready to re-immerse in forest living where she could begin to deconstruct much of the social matrices and underlying dissipative structures she found herself in observation of while living in NYC. This brought her to the San Bernardino National Forest where she facilitated experiential science-based ecology and environmental classes for thousands of children all across Southern California. Then, in June 2011, while participating in a Wilderness First Responder course in the mountains of Massachusetts, Serena was struck by lightning. While already having had a strong relationship with electricity before this event, this strange synchronistic moment catalyzed an intense ripple effect of varying phenomena that eventually led Serena to living in Kuala Lumpur, Malaysia – a city with some of the most grounded lightning strikes on the planet. Exactly one year after the lightning strike, Serena experienced her first inner dance – which in it held electric vibrations three or four times stronger than the lightning strike itself. Transformation and hypersensitivity was nothing new for Serena, therefore leading her to deeply trust what her experience spoke and how it would continue to change her life in relation to the greater dreams of a planet and the visions she herself knew as real. Now, Serena combines her love of learning, healing, community, science, and integrative wholeness systems into all she is. Finding flow within the forms and the formless, life is no longer a doing but a remembrance of being while creating spaces for gifting each other with possibilities for resonant change and transformation. Exclusions: Credit card charges, bank transfer fees. In Conversations, we enter a kind of Generative Dialogue – a conversational exchange, in which a deep connection with inner awareness, within and between us, becomes lively. As this shared connection with inner awareness deepens, we are sensitive to what arises naturally. We are attentive to how what arises points to important patterns unfolding in our lives. In this process, nsights and outcomes emerge naturally, issues resolve, while our relationship with our true self, the source and ground of Life itself, deepens. Conversations on the Edge of Silence offered by Nirarta's founder, Peter Wrycza, PhD, are the fruit of many years of personal and professional exploration and development. Neither therapy, nor coaching or counselling, Generative Dialogue brings a new depth and wholeness to the helping relationship. If you would like to explore the deep life-patterns influencing your life as a whole over time, and resolve some of the deep contradictions implicit in them, you might welcome a special longer Conversation with a session of Re•Patterning, . 'Writing my end-of-year 'Round Robin' letter has filled me with gratitude for perhaps the best memory – staying at Nirata midst beauty itself in May this year, and the nourishment on many levels I received.